When we think about the ocean, we may visualize sea turtles swimming around coral reefs, sea urchins anchored in tide pools, dolphins breaching the surface. Or even shrimp gathered around deepwater sulfur vents. But most of the ocean is just open water. Miles and miles of it from below the surface to thousands of feet down. This ocean midwater is the largest habitat on Earth! Yet midwater habitat has not been well-studied. That's because it is difficult to explore. It's mostly cold, dark and under high pressure. Some of its most surprising secrets are animals without backbones (invertebrates). Think of worms and jellies. They come in a variety of weird colors and shapes. Many of these midwater species have never been recorded by science. Scientists are challenged to figure out what they are. 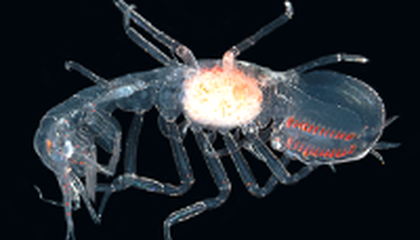 Marine biologists use specialized equipment to find the open ocean's unique invertebrates. Remotely operated vehicles provide a view of the mysterious world of suspended life. The vehicles are essentially robots controlled from ocean-going ships. Using video cameras, water sensors and unique collection equipment, zoologists catalogue and capture examples of organisms. Many never have been named before. Some of these organisms rewrite what we know about the intricate web of ocean biodiversity. Find out more watching this Smithsonian Science How webcast. It's titled Ocean Biodiversity - Discovering Marine Invertebrates. It's on the Q?rius website. Appearing on the webcast is Dr. Karen Osborn, an invertebrate zoologist at the National Museum of Natural History. Get teaching resources to support your webcast experience. This article is about the exploration of the deep sea. Because of the dark water and cold conditions many people don't travel there.because not many people travel there not all species are discovered. I think that the unexplored territory makes it safer for these creatures. Until humans can travel there these animals will be safe. To be honest I kind of expected this because we barely searched the whole ocean, who knows what else can be there. This is amazing this proves we discover knew things every day. Wow i'm surprised they haven't already found that species in the ocean but it is really pretty. I wonder if it was just made as a new species. This article is really cool. It also kind of scary. Just to know that there are species out that scientist don't know of sends shivers down my spine. This article is cool because there are some pretty neat species out there, and according to the picture they are awesome! I really liked this article. The ocean can be an odd place but when you go deeper things get alot darker and cooler. Now I know that there is stuff out there and could be very very weird. or spider or a mix of both. 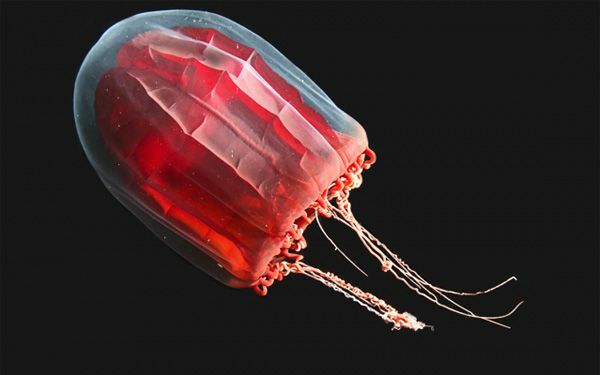 Many people don't know of all of the cool studies of the life in the deep water of the Ocean. One reason is because there isn't much information because it is very hard to make studies because the water is dark and it is under high pressure. This part of the ocean is home to many invertebrates like worms or jellies. These marine biologists use very special equipment to study this part of the ocean. They even use remotely operated vehicles to go down in the sea. This is interesting because it tells how hard it is and how marine biologists study this part of the ocean. Many people are finding new species in the deep ocean everyday. Because the water is very cold and also very dark. This leads to very few people exploring the oceans depths. The animals found are very unusual, and many have strange adaptations to help them survive the ocean depths. I think this article was interesting and showed rhe oceans amazing size. It's cool that there is new spieces in the ocean and that were discovering them. Scientists have found lots of new species in the ocean and have found some weird creatures. It's cool my more animals are found. This article is about the deep ocean. How it has all kinds of creatures like held and turtle. You can't go to deep because of the pressure. I would never go that deep.